MBARI has developed autonomous underwater vehicles (AUVs) with capabilities to map the seafloor with higher resolution than is possible with hull-mounted or towed sonar systems. There are now two AUVs optimized for meter-scale mapping in the MBARI fleet. The vehicles are equipped with four mapping sonars that operate simultaneously during a mission: a swath multibeam sonar, two sidescan sonars, and a sub-bottom profiler. The multibeam sonar produces high-resolution bathymetry (analogous to topography on land), the sidescan sonars produce imagery based on the intensity of the sound energy’s reflections, and the subbottom profiler penetrates sediments on the seafloor, allowing the detection of layers within the sediments, faults, and depth to the basement rock. All components are rated to 6,000 meters depth. The vehicles are launched on programmed missions and run on their own battery power until they return to the ship, as programmed, for recovery. MBARI has also developed an Iceberg AUV configuration in which a multibeam sonar and scanning sonars are oriented sideways, allowing the AUV to find and map the underwater structure of icebergs. The Iceberg AUV was tested using the vertical cliffs of Monterey Canyon and then used in 2017 in fjords of East Greenland to map the size and shape of icebergs calving off of the Greenland ice sheet. In honor of MBARI’s long-time Board member Dr. D. Allan Bromley of Yale University, who passed away in 2004, the first Mapping AUV was christened the D. Allan B.
MBARI’s mapping AUV underwater, during a cruise off Southern California. 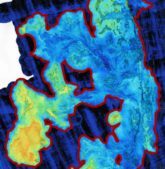 A fundamental activity in marine science is to use mapping technology to image the structure and character of the seafloor. Sonars that are hull-mounted or towed can provide high quality seafloor maps in shallow water, but cannot show details in seafloor features such as lava flows or slumps in typical ocean depths. Using platforms mounted with high-frequency sonars that can operate in deep waters is necessary to map the seafloor at high resolution. Since high-frequency sound is required to obtain high-fidelity maps of the seafloor, and high frequencies are attenuated by sea water, the sonar must be brought close to the seafloor to produce the highest quality maps. Platforms in the past have consisted of submersibles, which are expensive, noisy and erratic, or towed systems, which in deep water and especially near rough seafloor, can be dangerous and slow and produce data that is not precisely located and contaminated by ship motion. AUVs provide a faster, more nimble platform to produce very high-quality data sets especially in the deep ocean, and can accomplish this task efficiently and reliably. Computer-Aided-Design (CAD) drawing of the batteries, sensors, and computers assembled in the interior (top), surrounded with syntactic foam for flotation (middle), and encased in the plastic outer fairings (bottom). Ship operations most often from MBARI’s R/VRachel Carson but has been operated from other vessels ranging from a 24 m (80 ft) pilot boat to a 110 m (360 ft) icebreaker. Freewave RF modem, 57.6 kilobits per second. The AUV is usually deployed and recovered over the side of a ship using a crane. MBARI AUV technicians communicate by radio to the AUV while it floats at the ocean surface to download the mission script to it and check that all of the systems and instruments are fully functional. Then the AUV receives a command to dive. Once submerged it is no longer in contact with the global positioning system (GPS). The doppler velocity log (DVL) can lock onto the bottom when the AUV is within 130 m of the seafloor. In waters deeper than 130 m, the navigation of the AUV is updated on descent using ultra-short baseline (USBL) acoustic tracking from the ship until the DVL locks on to the sea floor. Then the inertial navigation system (INS) takes over, aided by the DVL. Since the AUV is programmed with its mission script, it is usually not tracked during the survey, which means the research vessel can conduct other tasks and recover the AUV at a later time period. When an articulating crane with a capture head is available, as on MBARI’s AUV mother vessel, R/V Rachel Carson, AUV recovery is accomplished by maneuvering the ship alongside the AUV and hooking into the lifting bale. Otherwise, a small boat may be used to bring the AUV to the ship, and manually hook the bale to the ship’s crane. The primary mapping sensor is a Reson 7125 400 kHz multibeam sonar. It produces swath bathymetry and backscatter intensity. The bathymetry data is 1 meter lateral resolution in surveys flown at 50 meters altitude, and lower resolution if flown at higher altitudes. The vertical precision is 0.10 meters (limited by pressure sensor). Edgetech 110 kHz chirp sidescan sonar images the seafloor character such as surficial texture, near surface density variations and other fine-scale features at ~0.1 m resolution. Edgetech 1-6 kHz chirp subbottom profiler images subsurface sediment structure. It achieves up to 50 m penetration with 0.1 m vertical resolution. The current navigation system used on the mapping AUV is the Kearfott SeaDevil inertial navigation system (INS). It also includes the Doppler velocity log (DVL) as well as a ring laser gyro. If the DVL continuously tracks the seafloor, the real-time navigation deviation is 0.05% of the total distance traveled. The INS also provides data on the vehicle attitude (pitch, heading, and roll). The pressure sensor can precisely measure vehicle depth at a standard deviation of 0.1 meters up to 6000 m depth. Control algorithms use this data to maintain a stable platform and to record the vehicle’s track. For the vehicle to fly at a safe and uniform altitude over the seafloor, missions are planned over the most reliable maps available, typically using bathymetry collected using ship-mounted sonars. The mission route is planned interactively in a visualization tool that is part of the MB-System software package. Deep water missions start on the surface where the vehicle obtains a valid global positioning system (GPS) fix and begins a spiral descent. Without DVL bottom lock, the INS drifts rapidly. In order to stabilize the INS position during decent, USBL tracking of the AUV by the ship is relayed to the AUV using the acoustic modem. Once the AUV is close enough to the seafloor that the DVL can measure velocity relative to the bottom, USBL aiding is no longer needed and is stopped. Once operational depth is achieved, the AUV starts the designed mission. Survey missions are typically composed of a sequence of straight lines that connect at waypoints. The navigation requirement for MBARI seafloor mapping operations is that the real-time navigation error at the end of the survey be no worse than half a swath width. This allows the navigation post-processing tool in MB-System,Mbnavadjust, to locate overlapping and crossing swaths. This tool matches bathymetric features in overlapping swaths and solves for a navigation model with relative precision equivalent to the lateral resolution of the bathymetry data. The bathymetry map above shows the original real-time INS navigation in red overlain with the final adjusted navigation in black. The navigation adjustments for this survey are modest: the largest relative adjustment required to match overlapping features is 30 meters. The multibeam processing package MB-System is used extensively for planning the surveys, and for post-survey correction of roll and pitch biases, editing erroneous soundings from the bathymetry data, piecing together multiple surveys, and adjusting the navigation data. Data products include bathymetry grids, sidescan mosaics, subbottom profiles, and GIS-compatible files. Plan to “mow the lawn” (survey grid) in Mbgrdviz. Surveys are planned with MB-System’s package “Mbgrdviz”. Altitude off the bottom, line spacing, and crossings can all be specified. Missions are typically composed of a sequence of straight lines that connect at waypoints. Missions are downloaded to the vehicle over a radio link before the dive. Waypoints can also be sent to the ship’s bridge. The vehicle’s attitude (roll, pitch, and heading) are logged and accounted for in post-processing. Biases introduced by slight differences in alignment between the sensors can be analyzed and corrected. Sonar data are edited with MB-System’s package “mbedit” and 3-D ping viewer “mbeditviz”. All the beams within each ping of the swath are displayed for editing. Bad beams can be flagged so that they will not be considered during further processing. Programmed into the deployment’s track are several crossings so that drift during the dive can be corrected later. MB-System’s utility “Mbnavadjust” is used to match features in overlapping swaths and adjust the navigation. It is important to adjust for navigation since errors accumulate during each survey. For a 17.5 hour mission, the upper limit on navigation error is 44 meters with a standard deviation of 10 to 20 meter errors. The Canyon Processes project maps the axis of Monterey Canyon regularly to detect bathymetric changes due to sediment transport events. The MARS project used the AUV to map the cable route. 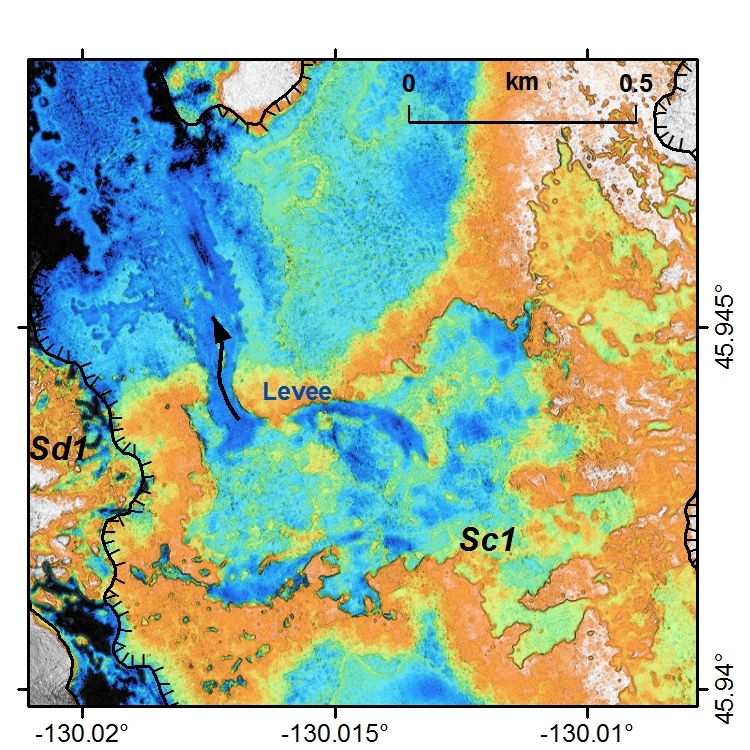 The Submarine Volcanism project has been mapping the summit and rift zones of Axial Seamount since documenting the flows of the 1998 eruption with ship-board multibeam sonar a few months afterward. 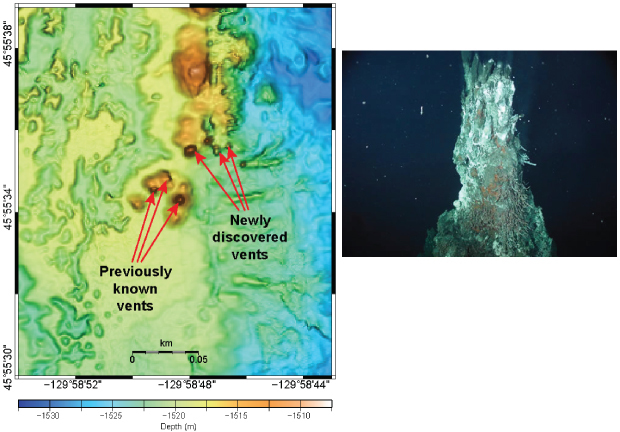 Subsequent expeditions have coupled AUV bathymetry with ROV observations, allowing precise determinations of the extent of new lava flows after the 2011 and 2015 eruptions. Side-by-side comparison of multibeam bathymetry showing the improvement that AUV-collected data offers over ship-collected data. The area includes part of the 1998 flow and the “International District” chimneys (see map below for close-up). (Left) ship-collected bathymetry at 20 m resolution. (Right) AUV-collected bathymetry at 1 m resolution. (After Figure 3 of Paduan et al., 2009). AUV map of a lava pond on the floor of Axial caldera that breached a levee and continued to flow northward. Color ramp is -1544m (blue) to -1539m (orange). (Figure 14 of Clague et al., 2013). 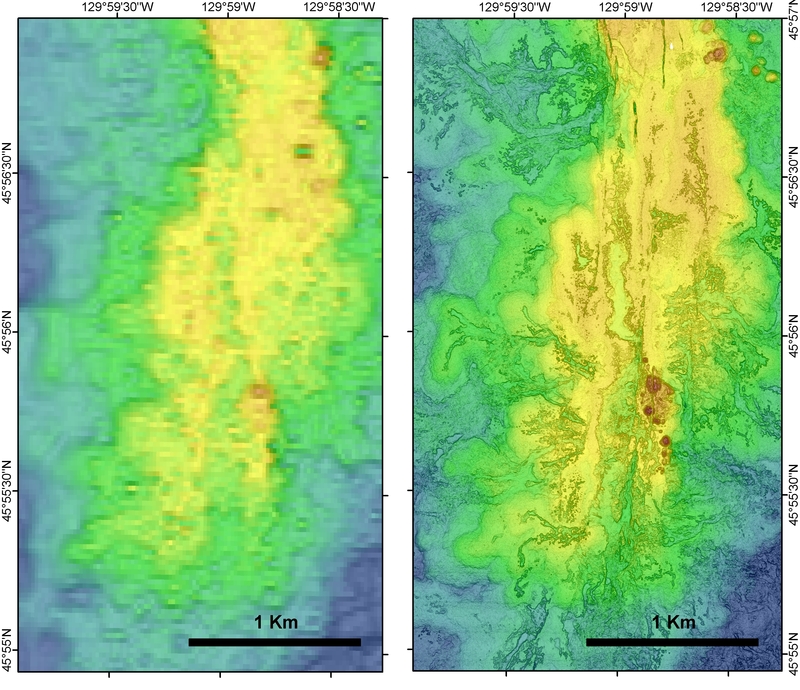 AUV before and after difference map of the 2011 flows on the caldera floor. Color ramp shows 0 to +15 m depth change. (After Figure 2 of Caress et al., 2012). Clague, D.A., Caress, D.W., Dreyer, B.M., Lundsten, L., Paduan, J.B., Portner, R.A., Spelz-Madero, R., Bowles, J.A., Castillo, P.R., Guardado-France, R., Le Saout, M., Martin, J.F., Santa Rosa-del Rio, M.A., & Zierenberg, R.A. (2018). Geology of the Alarcon Rise, Southern Gulf of California. Geochemistry, Geophysics, Geosystems. doi:10.1002/2017GC007348. Clague D.A., Paduan, J.B., Caress, D.W., Chadwick Jr, W.W., Le Saout, M., Dreyer, B.M., Portner, R.A. (2017). High-resolution AUV mapping and targeted ROV observations of three historical lava flows at Axial Seamount, Oceanography, 30(4), 82-99, doi: 10.5670/oceanog.2017.426. Maier, K. L., Brothers, D. S., Paull, C. K., McGann, M., Caress, D. W., & Conrad, J. E. (2016). Records of continental slope sediment flow morphodynamic responses to gradient and active faulting from integrated AUV and ROV data, offshore Palos Verdes, southern California borderland. Marine Geology. doi:10.1016/j.margeo.2016.10.001. Paduan, J., Clague, D., Caress, D., & Thomas, H. (2016). High-resolution AUV mapping and ROV sampling of mid-ocean ridges. Presented at the Marine Technology Society / Institute of Electrical and Electronics Engineers Oceans Conference. doi: 10.1109/OCEANS.2016.7761264. Clague, D. et al. (2014), Eruptive and tectonic history of the Endeavour Segment, Juan de Fuca Ridge, based on AUV mapping data and lava flow ages, Geochem Geophys Geosystems, 15(8), 3364–3391, doi:10.1002/2014GC005415. Chadwick et al. (2013), The 1998 eruption of Axial Seamount: New insights on submarine lava flow emplacement from high‐resolution mapping, Geochem Geophys Geosystems, 14(10), 3939–3968, doi:10.1002/ggge.20202. Clague, D. et al. (2013), Geologic history of the summit of Axial Seamount, Juan de Fuca Ridge, Geochem Geophys Geosystems, 14(10), 4403–4443, doi:10.1002/ggge.20240. 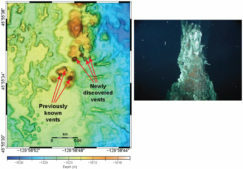 Caress, D., D. Clague, J. Paduan, J. Martin, B. Dreyer, W. Jr, A. Denny, and D. Kelley (2012), Repeat bathymetric surveys at 1-metre resolution of lava flows erupted at Axial Seamount in April 2011, Nat Geosci, 5(7), 483–488, doi:10.1038/ngeo1496. Paull, C., D. Caress, W. Ussler, E. Lundsten, and M. Meiner-Johnson (2011), High-resolution bathymetry of the axial channels within Monterey and Soquel submarine canyons, offshore central California, Geosphere, 7(5), 1077–1101, doi:10.1130/GES00636.1. Paull, C., W. III, D. Caress, E. Lundsten, J. Covault, K. Maier, J. Xu, and S. Augenstein (2010), Origins of large crescent-shaped bedforms within the axial channel of Monterey Canyon, offshore California, Geosphere, 6(6), 755–774, doi:10.1130/GES00527.1.